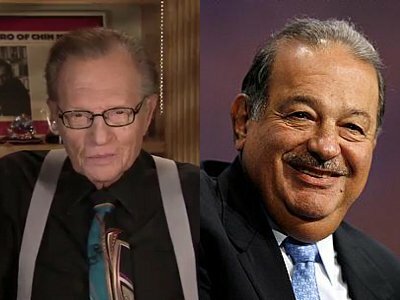 Carlos Slim is so rich that he is buying Larry King and putting him on the Internet. I’m sorry, but somebody got Mr. Slim all wrong. As a fellow Mexican, I’m sure the reporters asked him some question, and he replied with a typical “¡ora, ora! ¡no me pregunten esas cosas!” or some stuff like that. So worry no more, Mr. Slim. I will help you get the record straight on this side of the border. So perhaps in exchange you can get Mi blog es tu blog a little part on your network? I’d call it the ¡Órale! network. This entry was posted in Latin America, Marketing & Advertising and tagged Carlos Slim, Larry King, Ora.TV. Bookmark the permalink.